Commercial real estate experts say that adding alcohol sales to supermarkets is a no-brainer that will boost asset values and sales for companies that secure the highly-coveted licences. The sale of wine in grocery stores was launched in October in Ontario joining British Columbia which has permitted wine sales in grocery stores since April 2015. Beer and cider on the aisles of Ontario supermarkets was first allowed in December 2015 breaking a long held monopoly on sales enjoyed for decades by The Beer Store and LCBO. The number of B.C. grocery stores selling wine, cider and sake on their shelves is inching up, but the government’s process to reform alcohol sales has yet to bring wine to grocers in Vancouver and other large markets, including Burnaby and Richmond. Loblaw aims to introduce wine sales at two more B.C. locations by the end of November, the company said in a statement. Overwaitea Food Group already sells wine in 11 of its Save-On-Foods grocery stores in several cities, including Surrey, Langley, White Rock, Prince George, Kelowna and Kamloops. But so far, no grocery stores in the City of Vancouver have secured licenses to sell wine. Each province governs the laws and regulations that control the sale of alcohol, and municipalities in B.C. can enact zoning bylaws that control where liquor stores can be located. The B.C. government in 2013 launched a reform process to allow grocery stores to bid in auctions for the chance to secure a wine-selling license, or to relocate existing wine-only sales licenses from standalone wine stores to their supermarkets, said Bill Anderson, a spokesman for the Ministry of Small Business and Red Tape Reduction. He said the government heard through public consultation that most British Columbians wanted the option of buying their groceries and wine at the same location. He said the province opted to use an existing licensing regime for the grocery store sales that has been used for years to regulate standalone wine shops that sell B.C. vintages. Beer sales remain confined to government and private standalone liquor stores. He said another auction for six additional licences will be held in mid-December. “We may auction off an additional six, which would mean that we’ve auctioned off 18 in total,” he said. “The B.C. 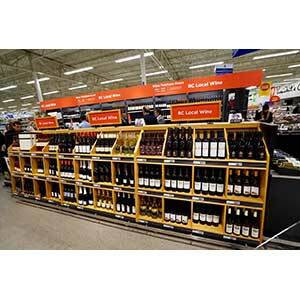 wine on [grocery store] shelves model is a limited program that will never see more than 60 outlets,” Anderson said. B.C.’s approach to increasing its number of private alcohol sales outlets is an intriguing transformation, said Craig Patterson, a national retail consultant and editor-in-chief of Retail Insider. He said the government is essentially adding competitors to a market in which it also competes for sales. Loblaws and Overwaitea have certainly boosted the overall value of their assets by adding booze sales, Patterson added. “Anything that you can do as an extra attraction or amenity within a store — in this case a grocery store — is going to draw more customers to the store,” he said. Only pre-screened grocery stores with at least 10,000 square feet that sell primarily food can qualify for the auction, according to the ministry. The proposed grocery store can be located anywhere in the province and there are no geographic restrictions on the location or the proximity of the proposed site to other liquor retailers. The minimum bid for the auction is $125,000. “Retail liquor sales have been the most regulated category in retail real estate,” said Jason Schouten, a principal with Avison Young in Vancouver. Schouten said its a no-brainer for grocery chains to get on the booze bandwagon in B.C. “Does it make them more attractive? Yeah, but [grocery stores] are some of the more sought-after assets in this day and age from a retail perspective anyway,” he said.